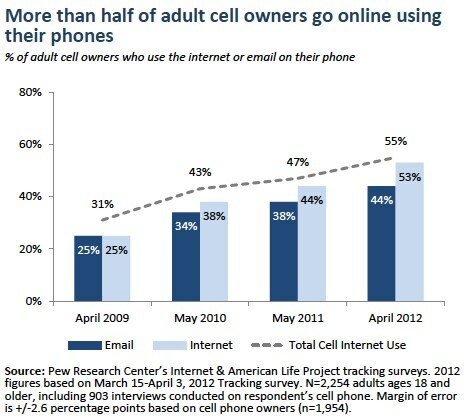 More than half of all adult cell owners now use their phones to go online as of April 2012. Our definition of a “cell internet user” includes anyone who uses the internet or email on their cell phone, and 55% of all adult cell phone owners use their phones for one or both of these reasons. Because 88% of U.S. adults now own a cell phone, that works out to 49% of all U.S. adults who go online using a cell phone at least occasionally. Three-quarters of these cell phone internet users (74%) say that they go online using their phone on a typical day1—meaning that on a typical day fully 41% of all cell owners are using their phones to go online. 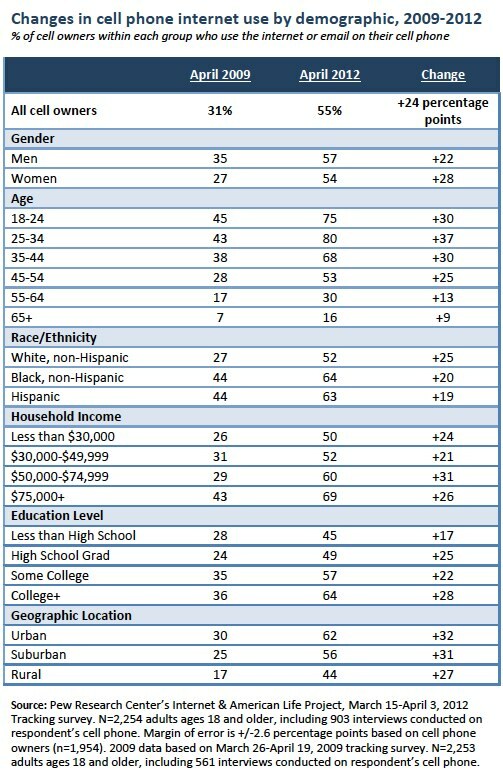 Cell phone internet usage is generally highest among groups with relatively high levels of smartphone ownership, and every major demographic group is more likely to engage in this activity in 2012 than was the case in 2009. The fastest-growing group over that time period is 25-34 year olds—fully 80% of cell owners in this age group now use their phones to go online, a 37-point increase from the 43% of such cell owners who did so in 2009. Other age groups with high levels of cell phone internet usage include young adults ages 18-24 (75% of cell owners in this age group use their phones to go online) and those ages 35-44 (68%). On the other hand, seniors (defined as those 65 years of age or older) have joined the cell internet user ranks in modest numbers. Although seven in ten seniors now own a cell phone, just 16% of them use their phones to go online—this is by far the lowest usage rate of any major demographic group. Race/Ethnicity – Roughly two-thirds of black and Latino cell owners go online using their mobile phones, compared with half of whites. Geographic location – Even though the proportion of rural cell owners who go online using their phones has more than doubled since April 2009, urban and suburban cell owners remain significantly more likely than their rural counterparts to go online using their phones. Household income and Educational attainment – Along with having high overall levels of smartphone ownership, the relatively well-off and well-educated are more likely than cell owners with lower levels of income and education to use their phones to go online. When asked what device they normally use to access the internet, 31% of cell phone internet users say that they mostly go online using their cell phone. 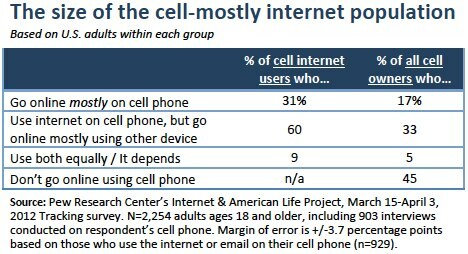 Throughout this report, this group will be referred to as “cell-mostly internet users.” Meanwhile, six in ten cell internet users (60%) say that they mostly go online using some other type of device, such as a desktop, laptop, or tablet computer. This group will be referred to as “cell-occasionally internet users.” An additional 7% volunteered that they use their cell phone and some other device equally to go online, and 2% said that their choice of device depends on the situation at hand. Since just over half of all cell owners use their phones to go online, this means that the cell-mostly group represents 17% of all adult cell phone owners in the United States. 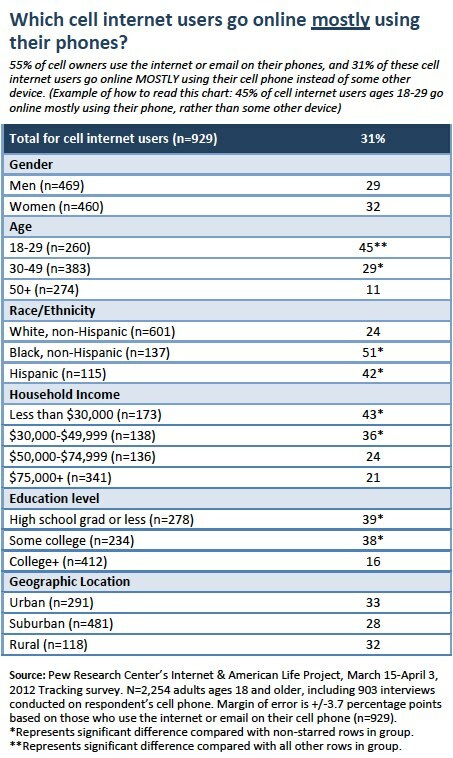 Young adults – Nearly half of cell internet users ages 18-29 (45%) do most of their online browsing on their phone. Non-whites – Half (51%) of black cell internet users do most of their online browsing on their phone, double the proportion for whites (24%). Two in five Latino cell internet users also fall into the “cell-mostly” category. Those with an annual household income of less than $50,000 per year, and those who have not graduated college. 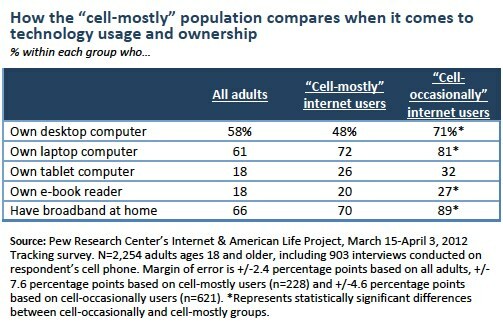 Compared to the overall population, these cell-mostly internet users have roughly similar ownership rates of various technology assets. However, they are considerably less likely than the “cell-occasionally” group (those who go online using their phones but who usually use some other device) to own a desktop or laptop computer, to own an e-reader device, or to have a broadband connection at home. Cell phones are convenient, always available – Nearly two-thirds of cell-mostly users mention factors related to convenience or availability. Some 38% of cell-mostly users cited the convenience of cell phones as the main reason why they do most of their online browsing on their phone, and an additional 23% cited the fact that their cell phone is always with them. Cell phones better fit people’s usage habits – Roughly one in five cell-mostly users say that their online habits (or the habits of those around them) make their cell phone their preferred choice for going online. 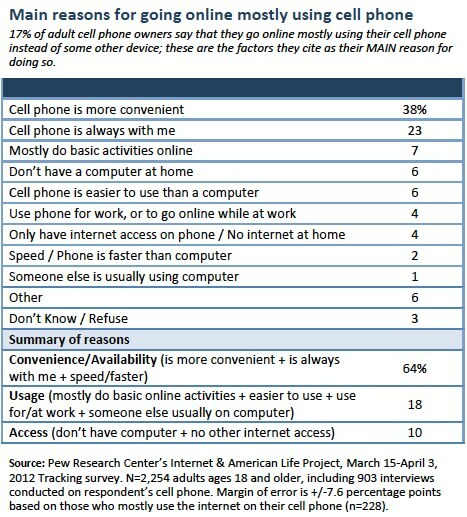 For example, 7% say that they do mostly basic activities when they go online and do not require a more advanced device, while 6% say that they simply find their cell phone to be easier to use than a traditional computer. An additional 4% cite the demands of employment—they use their phones to stay connected with their jobs when out of the office, or to go online for personal reasons while on the job. Cell phones fill access gaps – A total of one in ten cell-mostly users point towards a lack of other access options as the main reason why they primarily use their phone to go online, with 6% saying that they do not have a computer at home and 4% saying that they do not have any other source of online access at home. Interestingly, the proportion of cell-mostly users who cite access concerns as the main reason why they do most of their browsing on their cell phone is substantially smaller than the proportion who do not have a broadband connection or home computer (for example, 30% of these cell-mostly users do not have a broadband connection at home, but just 4% cite a lack of access options as the main reason why they conduct most of their internet use on their phone). Access issues may be a second- or third-order concern for some cell-mostly users. Because we only asked for the main reason people mostly use their phones to go online, our data would not capture these secondary concerns. Some cell-mostly users may be choosing to opt out of traditional internet access in favor of their cell phone for the other reasons listed (i.e. cell phones are a more convenient form of access and/or fit better with their usage patterns). Even if they lack a computer or broadband connection at home, some of these users may be having their access needs sufficiently met elsewhere (such as at work or school).